HIMPACT was designed from the ground up to provide superior results for both store and DC integrated in the same solution. For Food and Grocery, where high turns and promotions are an everyday event and margins are paper thin, better management of your inventory is essential. Additionally, the importance of handling date-sensitive products and better managing spoilage is a top priority. 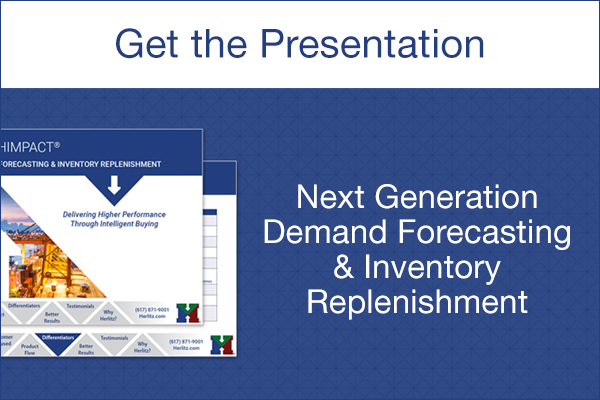 Advanced Demand Forecasting better tracks demand. Improve fill rates, increase sales and lower waste. Re-forecast daily and replenish your inventory multiple times per day. No need to wait for the night job to run. Daily Alerts on Promotional Products. Identify potential problems earlier, giving you more time to find a solution. Daily Variation in demand within the week is automatically tracked for each product and location. The “seasonality within the week” is integrated into replenishment ordering. Deliver a better flow of product, particularly for date-sensitive SKUs. Shelf Life rules drive the logic of replenishment calculations and are integrated into Promotional planning and Overstock transfer calculations. Track Promotional Demand down to the Customer/Store levels. Identify by chain and region and store what was sold on promotion. Identify when your customers’ preferences change, up or down. Our “Big Data” drill down helps you know the demand shifts at the location and SKU level. Know what happened without changing screens! Our proprietary demand forecasting and built-in analytics will give you a truer picture of your business and your customers. Know more and make smarter buying decisions. See our Wholesale and Retail pages for more about our advanced solution.